A number of amateurs were recognised at the Annual General Meeting/Open Forum at the WIA Annual Conference Mildura 2012. 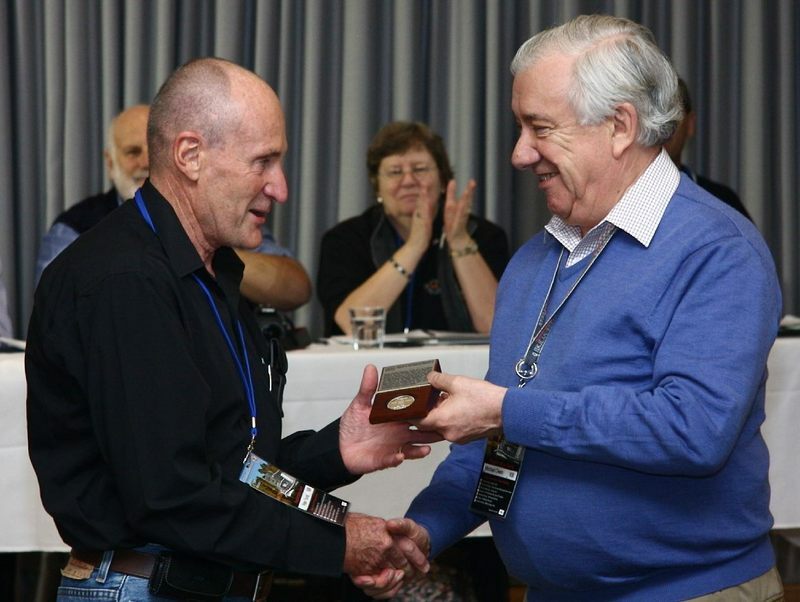 Former Director, but still responsible for Government Liaison and the Monitoring Service, Peter Young was presented with the GA Taylor Medal, one of the most prestigious awards made by the WIA, in recognition of his unique contribution to amateur radio. The Chris Jones Award was presented to Gavin Reibelt VK4ZZ in recognition of his contribution to the Townsville Amateur Radio Club and to the WIA Exam Service and, at the same time, his untiring promotion of amateur radio in his community. The Ron Wilkinson Award was presented to Dale Hughes in recognition of his work with WRC-12 including as a member of the Australian delegation the many technically excellent articles published in Amateur Radio magazine. The Al Shawsmith Award for journalism was presented to Justin Giles-Clark VK7TW for his article 'Modern communications technologies - a quick Centenary review and the future', published in the December 2011 issues of Amateur Radio. The Amateur Radio Technical Award was presented to James (Jim) Tregellas VK5JST for his articles 'An introduction to stepper motors’ and 'Building an 80 metre magnetic loop antenna for your attic', published in the May, July and August 2011 issues of Amateur Radio. The Higginbotham Award was presented to David Clegg VK5KC for his many activities over the years supporting amateur radio, the WIA and the clubs. In addition to the President's Commendations presented to the WIA’s Nominated Assessors reported separately Presidents Commendations were presented to Neil Husk VK6BDO for his outstanding work in relation to HAM college, Keith Bainbridge VK6XH for his many years of contribution, including his contribution to the Awards program and Onno Benschop VK6FLAB in recognition of his active participation in many aspect of amateur radio as a newly licensed amateur. David McAulay VK3EW and Alek Petkovic VK6APK were both honoured by a President’s Commendation for their ongoing contribution to the WIA Awards Committee.